The methods and materials used in the transfer and processing of coin and currency have changed dramatically over the years. These changes have evolved due to the consolidation of banks and the introduction of the Money Center Banking concept and regional processing centers, as well as the rise in National and Regional Retail chains who wanted a consistent procedure. Connover Packaging has a complete line of banking and cash management products that speaks directly to these changes, ensuring that currency, cash, and other valuables are handled accordingly. 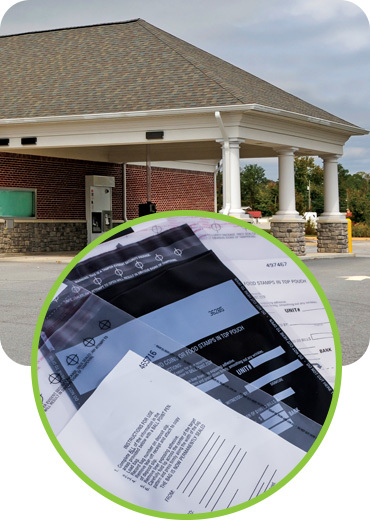 Our line of products include cash deposit bags to help you keep your currency, checks and other negotiables secure throughout your business cycle for a variety of needs, including point of sale, cashing out drawers or end of shifts, manual deposits, checks, payroll, and more. All bags are manufactured in accordance with Federal Reserve Bank guidelines. Our bags are some of the most tamper-evident in the industry – designed with an array of security features to detect if the bag has been tampered with, or an unauthorized individual attempts entry. Get high-quality checks and deposit tickets from Connover, giving you a trusted, single source for these plus binders, endorsement stamps, currency bands, coin wrappers, and bags – all from the same supplier. Learn more about our deposit slips. Checks are available in 2, 3, 4, and 5 part carbonless sets. Conversion to our deposit tickets is simple and we can help you make the easy transition. Just like our deposit bag distribution program, shipments are invoiced at the end of each month, accompanied by a comprehensive store-by-store listing for better accounting distribution.